Rosewater, cinnamon, almonds and honey give this easy dessert a mildly Middle Eastern flavour. Great served warm or cold so you take it on your picnic or eat in your garden, however your mood takes you. 1. Preheat the oven to 200˚C, gas mark 6. Halve and stone the peaches and place, cut-side face up in a shallow baking dish. Dot the butter into the cavities. Sprinkle with the lemon zest then drizzle with the lemon juice and honey. Bake for about 25 minutes until the peaches are tender and just beginning to colour around the edges. 2. Scatter the almonds, cinnamon and 2 teaspoons of the sugar in a small, dry frying pan and heat gently for 3–4 minutes, shaking the pan frequently until the almonds are golden. Tip on to a sheet of greaseproof paper and leave to cool. 3. Whip the cream in a bowl with the remaining sugar and the rosewater until softly peaking. Turn into a bowl and chill. 4. 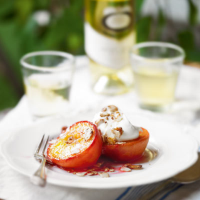 To serve, spoon the peaches on to serving plates and drizzle with the cooking juices. Spoon the cream on top and scatter with the almonds.